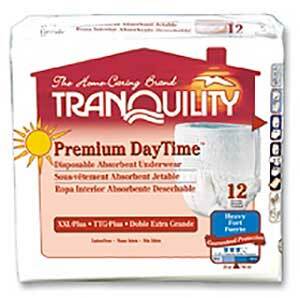 We carry Tranquility incontinence pads in stock. Feel free to call us with questions at (505) 327-4041. For Heavy Protection. 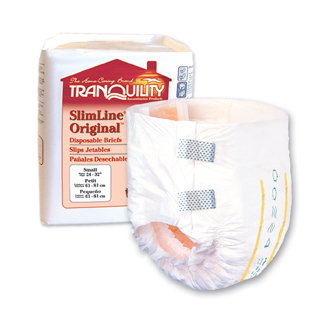 SlimLine briefs conform to the body for a comfortable fit while still providing superior absorbency. The Peach Mat core contains superabsorbent polymer which guarantees skin dryness, odor reduction and urine pH neutralization. The wetness indicator turns blue when maximum capacity has been reached, thus eliminating unnecessary changes and reducing costs. Kufguards® help contain bowel incontinence and prevent leakage. Sizes x-large, large and medium have refastenable tape tabs for easy opening and closing of the brief. Sizes small, x-small and junior have a cloth-like backsheet and micro-hook closure tabs. Available in six sizes. SlimLine briefs conform to the body for a comfortable fit while still providing superior absorbency. Sizes small, x-small and junior have a cloth-like backsheet and micro-hook closure tabs. Available in six sizes. Latex-free. For Maximum Protection. ATNs have maximum capacity in a disposable brief. Users can sleep all through the night uninterrupted by garment changes without compromising skin integrity. A patented Peach Mat core contains superabsorbent polymer which guarantee skin dryness, odor reduction, pH neutralization of urine and inhibition of bacterial growth. Reducing wet linens and extra laundry, ATNs provide a greater peace of mind for the caregiver and the user.